Recorded in Ireland as Haugh, Haugeh, and Hough, this is a dual nationality surname. It may be Gaelic and derive from O' hEachard, meaning the descendant of hEarchard, the latter being a derivative of the ancient Christian name of the 10th century 'Oghy', or it can be English. 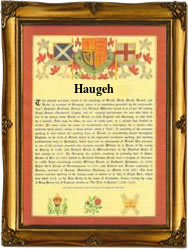 If the latter it is locational from one of the places called 'Hough', in Cheshire near Wybunbury, or in Derbyshire. These places are first recorded in the year 1176, and as English surnames were introduced into Ireland about 1640. The places names and hence the surnames have the same meaning of ' the settlement at the spur of a hill', from the Old English pre 7th Century 'hoh', spur of a hill, literally 'heel' of a hill. In Ireland the (Gaelic) surname is mostly associated with County Clare, and then in the spellings of Haugh or Haugeh, whilst in Limerick the spelling is Hough. One of the emigrants who left Ireland to avoid the dreadful Potato Famine of 1846 - 1848 was James Haugh, who left on the ship 'Roscius of Liverpool' on October 12th 1846, whilst slightly later William Hough, aged 24 yrs sailed from Belfast Lough on the ship appropriately named 'New-World' bound for New York on the 7th June 1847. The first recorded spelling of the family name anywhere in the world is that of William de Ho. This was dated 1121, in the register of the abbey of Bury St. Edmunds, Essex. Surnames became necessary when governments introduced personal taxation. In England this was sometimes known as Poll Tax. Throughout the centuries surnames in every country have continued to "develop", often leading to astonishing variants of the original spelling.